Known as the Emirates Mars Mission, the project is being designed to observe weather phenomena like Martian clouds and dust storms as well as changes in temperature, water vapor, and other gases throughout the layers of the atmosphere. The CU-Boulder part of the mission will be undertaken at LASP. The UAE’s U.S. scientific-academic partners also include the University of California, Berkeley and Arizona State University. Education and outreach efforts are expected to reach thousands of K-12 students, undergraduates and graduate students from around the world, said DiStefano. Leading the mission are more than 75 Emirati engineers and researchers, a number that is expected to grow to more than 150 by 2020. Mike McGrath, LASP engineering director and project lead at CU-Boulder, said that a team comprised of CU-Boulder faculty, LASP engineering and missions operations staff, and university students will contribute to the effort. The mission is still in its early planning stages, according to McGrath. The science objectives include round-the-clock global weather mapping of the Red Planet in order to better understand how surface weather changes the upper Martian atmosphere. Scientists are interested in how and why Mars—which has gone from a warm, wet planet to a cold, dry planet—is losing its oxygen and hydrogen into space. The UAE is a constitutional federation of seven emirates, or principalities: Abu Dhabi, Dubai, Sharjah, Ajman, Umm al-Qaiwain, Ra’s al-Khaimah, and Fujairah. Faculty, staff, and students from all three U.S. universities will work with UAE researchers on mission data analysis, said McGrath. LASP currently is leading NASA’s Mars Atmosphere and Volatile Evolution (MAVEN) mission that began orbiting Mars in September 2014 to help scientists better understand the role atmospheric gases played in changing the climate on the planet over the eons. 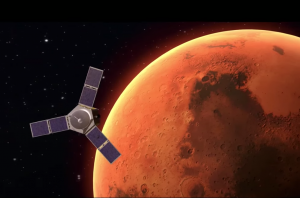 Data from the new UAE-led mission is expected to complement data from MAVEN and other NASA Mars missions.